Million-Dollar Blind Spots will help you uncover blind spots in your company and dramatically accelerate proper business leadership decisions. Million-Dollar Blind Spots has been hailed by industry professionals as a commonsense approach to risk management. A resource for management to find pools of cash in key departments of the company, this book will help career-motivated business executives unearth key risk areas and identify opportunities leading to sustainable growth, buzz-worthy customer value, and impressive profitability. 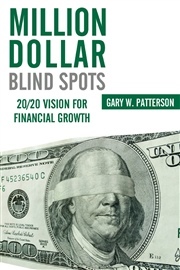 Gary Patterson has developed clever systems to avoid costly problems, increase profits, uncover million-dollar blind spots, answer questions about why risk management is important to find pockets of hidden cash, make faster business decisions, and reduce functional silos. When your team asks, ''What is financial risk management?'' Million-Dollar Blind Spots provides the answers. This book contains 125 questions to assess your company and strengthen balance sheets and income statements; describes insightful flash reports, metrics, and financial reporting templates; and illuminates key requirements for business plans to improve operations and raise crucial financing for your management team projects. If you desire to run your company like Jack Welch, then get this audiobook for your entire team. Gary Patterson is a Stanford MBA, CPA, and popular speaker who has worked with over two hundred companies and negotiated more than two dozen merger and acquisition deals ranging from start-ups to Fortune 500 companies. improve and accelerate your business leadership decisions! Gary W. Patterson, a 30-year senior management veteran, knows the risks that sink leaders when they’re not looking. Whether in sales, marketing, operations, information technology, or human capital, there’s something here for anyone in business looking to close the information gap, and impress the boss’s boss. Hailed as a commonsense, value-added approach to risk management, Gary’s book helps executives unearth key risk areas and identify opportunities leading to sustainable growth, buzz-worthy customer value, and impressive profitability.